We are engaged in offering our clients with optimal quality UL/CSA approved wires and cables. Known for their reliable electronic and electrical wiring either indoor use or outdoor use, enjoying an enviable reputation for its super quality and reliability. Manufactured using high quality bright, or tinned annealed electrolytic grade copper conductor confirming to ASTM B-268, these have conductivity more than 102% for smooth flow of electricity. 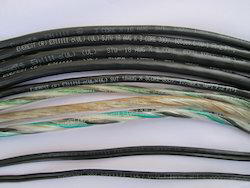 It has physical properties meeting the requirement as UL standard UL: 758 awm and UL: 62 for flexible service cord for indoor use or outdoor use with better fire performances as requirement by UL/CSA. Appliance wiring material (AWM UL: 758): complete range of more than 100 styles like 1015, 1569, 1007 etc. In varies types of insulation materials like PVC, LDPE, PP & XLPE. Looking for UL - CSA Approved Wires ?